In support of film studies, the Library has continued to add to our dvd collection located on floor one. Below is a selection of well-known titles from all genres that we have purchased over the last year or so. All of our dvds are available to be borrowed. Finally we would like to remind you of our film streaming resource Kanopy which provides access to many classic films and documentaries. We are very pleased to announce that our project, 'Supporting Diversity in Academic Writing', has received funding from the NUIG Equality, Diversity & Inclusion Project Fund. 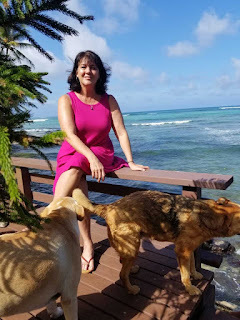 Thanks to this grant, we will be able to hold a unique interactive workshop given by writing tutors from the University of Hawaii on 29 January 2019 at 5pm. How can one support diversity through the teaching of academic writing? Do some practices reflect tutors’ unconscious biases and thus unintentionally lead to the silencing of diverse voices? Can cultural awareness be fostered through particular tutoring strategies? The workshop, conducted via a video-link, will address these questions through presentations and specially designed activities. 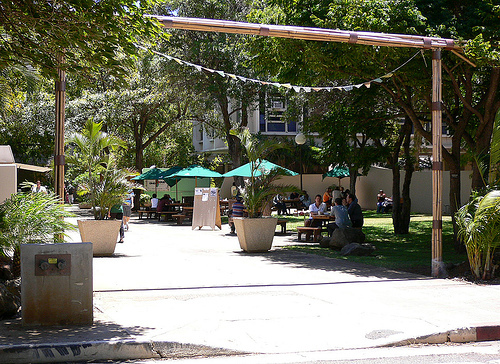 Located in a culturally diverse area with a long history of colonialism, the Writing Centre of the University of Hawaii is committed to facilitating inclusivity through querying current teaching practices and its state-of-the-art approach to writing pedagogy. The director of the Writing Centre of the University of Hawaii at Manoa, Dr Georganne Nordstrom, has been awarded a Fulbright fellowship to work at the AWC and the English department in 2019. Please post your questions and comments about teaching academic writing and inclusivity here. We we will do our best to address them all at the workshop. 14 December 2018 is the 100th anniversary of what was probably one of the most significant elections in Irish history. 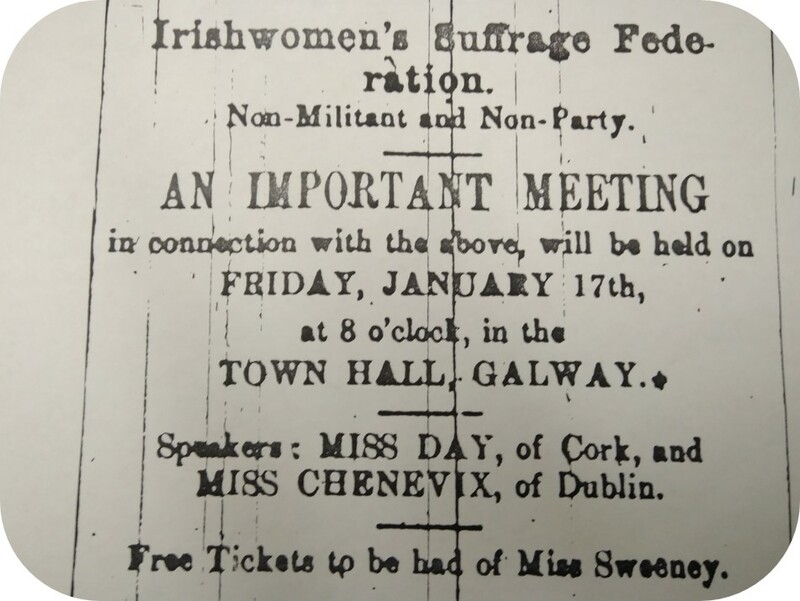 On Saturday 14 December 1918 the electorate on the island of Ireland, expanded from c.700,000 to over 2 million due to the Representation of the People Act (1918), went to the polls in what was the only 32-county general election. It was significant also because it was the first time women (over 30) were granted the right to vote to elect members of parliament and to be candidates in such elections. 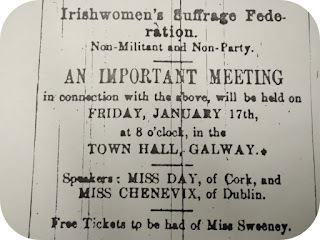 To mark the occasion Mary Clancy from Global Women's Studies in the School of Political Science and Sociology and Marie Boran, Special Collections Librarian, have collaborated on a visual display which tells the story of some of the women who campaigned in Galway and the West of Ireland for women's right to vote. The display will run on the Hardiman Building foyer video wall from 14-21 December. Please do drop by to view it. CFP: Writing and Well-being. 5 April 2019. 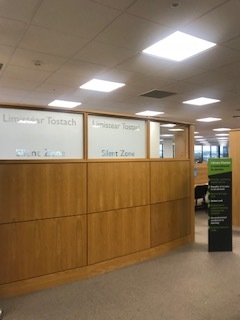 The Academic Writing Centre, James Hardiman Library, NUI Galway. Procrastination, writer’s block, failing a course due to being unable to finish writing assignments, and even debilitating anxiety—many of us who work with writers, whether in the classroom, the writing centre, or in another support capacity, encounter students who regularly experience these kinds of challenges. There are also those writers who explain writing as essential to their being, a form of therapy, and a release. Both sides of this spectrum point to the ways writing intersects with students’ well-being. Given that academic writing constitutes the core activity across multiple disciplines, professionals responsible for students’ workload and supporting writing should understand how mandatory writing assignments affect students’ physical and mental health and their emotional state; however, the subject remains under-researched, and the answers in hand are ambivalent. For example, while some writing practices have been cited as fostering students’ sense of confidence and self-worth (Virtanen 2007), there is a consensus that writing anxiety is prominent among multiple student populations (Baez, 2005). At the same time, studies of student stress (Bush et al., 1985; Abouserie, 1994, Schafer, 1994) do not specifically point to writing anxiety as a stress factor. While most of us understand developing a writing process as a way to intervene in writing-related anxiety, there is little direction in the scholarship on what to do when the writing process itself seems to exacerbate a student's stress. In speculating on ways to negotiate this issue in our pedagogies and practices, one might refer to the calls to see students’ writing as labour; as Horner (2000) and Rose (2012) argue, students’ time is a finite resource that should be used with a greater sense of responsibility. Traditionally, writing was seen as an invisible activity taking place purely in the realm of the intellect, away from the daily life of the students. This limiting view of writing obscures its impacts, whether negative or positive, on the physical world—on students’ bodies, minds, and broader aspects of their well-being. ● How do we teach/model well-being for student success and beyond? Proposals of 300 words should be submitted to irina.ruppo@nuiagalway.ie by Friday, December 21, 2018. Panel proposals are also welcome and should include a list of contributors. In addition to 20-minute talks, the conference will include a discussion forum. Please contact Irina.ruppo@nuigalway.ie if you are interested in giving a 5 minute presentation on any of the above subjects or a new subject related to writing and well-being. Informal queries are also welcome. We are looking forward to the arrival of Dr. Georganne Nordstrom, who has been awarded the Fulbright Fellowship to work with the AWC in the James Hardiman Library and in the Discipline of English in Spring 2019. It has been an amazing year for Irish fiction - a Booker prize winner and a bestseller from Castlebar. As well as Anna Burns and Sally Rooney there has been a wealth of new and established writers publishing new material in all genres. Here are some of the recent Irish novels we have added to our collection. All of these books are available from our Popular Reading Collection, currently on floor 1. We always welcome suggestions for new books to added to the Library's collection. The Library is currently running a short student survey about access to your reading list materials. do you have difficulty accessing your required readings - books, ebooks or articles? would you like your course modules to use our Reading List System as described below? Please take a minute to fill out the Student Reading List Experience survey. In the last two years we have, where possible, provided your lists online with our dedicated Reading List System. The list is created by the lecturer and links to ebooks, scanned chapters, full-text articles and our Library holdings. The list is accessed via the relevant Blackboard module. Using this system allows us to quickly check and keep track of your reading list requirements. It is easier for students to find their readings and we do everything we can to provide access to high demand material whether ebooks, scanned chapters, articles or more print copies. Currently we have over 450 reading lists online but we would like to extend use to as many modules as possible. If you would like to use this system please tell us by filling out the Student Reading List Experience survey. Oxford Bibliographies in Music combines the best features of a high-level encyclopedia and a traditional bibliography in a style tailored to meet the needs of today’s online researchers. Each article, written and reviewed by top scholars in the field, is rich with citations and annotations, expert recommendations, and narrative pathways to the most important works for virtually all areas of music. Click here to access the trial of Oxford Bibliographies in Music. Please submit the feedback form available here to assist in evaluating this resource. The trial ends on Friday 07 December 2018. With the recent nomination of Ithaca by NUI Galway graduate, Alan McMonagle (BComm, MA) for the Dublin Literary award we thought it would be timely to bring together the recent novels published by NUI Galway alumni from the past year or so. A police procedural by a former Law student, now based in Australia. Modern themes of AI and cyber reality merge in this technological/philosophical thriller. Young Irish emigrants and their misadventures in the Australian outback. 2017 Rooney prize winner. Set in a rain soaked Ireland of the future, this imaginative novel follows the journey of a young teenage father. Catherine Doyle received a major deal by Bloomsbury Publishing for this charming book set on an island off the west coast of Ireland, the first in an upcoming trilogy. All of the above books are available in the Popular Reading section of the Library and if we have missed any books please let us know. 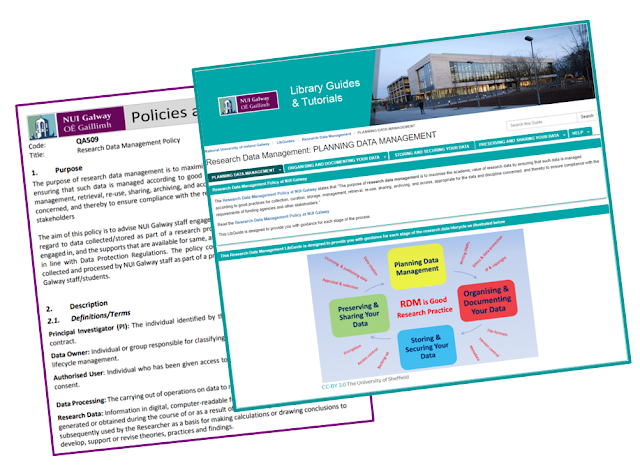 A new Research Data Management Policy at NUI Galway has been approved recently. It was developed by members of the Research Data Working Group and provides advice to staff engaged in research at NUI Galway about their responsibilities relating to data generated, collected and processed by NUI Galway staff as part of a project, which is led or contributed to by NUI Galway staff/students. For further information, guidance and support please consult the Library Guide on Research Data Management. It includes information about typical data-related activities undertaken in the research data lifecycle, how to write a data management plan and how to find and cite data. See also Research Data Working Group. The Library's reading list service is a one-stop teaching support service for academic staff..
provide direct linking to the list from Blackboard for your students. and materials used by students. -There is no requirement for separate book ordering or scanning requests. The Library will ensure sufficient access to your resources. -Once the reading list is created, it will roll forward for the next academic year. The Library will be automatically informed of any updates. -Unlike direct links added to Blackboard, the resources will all be available off-campus. 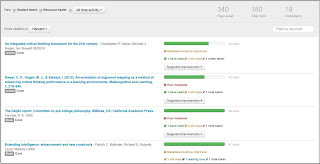 -Unlike uploaded articles on Blackboard, statistically important access/citation figures will increase and be accurate. -Each list has a durable url and could be, for example, added to Akari as a permanently updated list. There is no loss of important module information if there a change in teaching personnel. 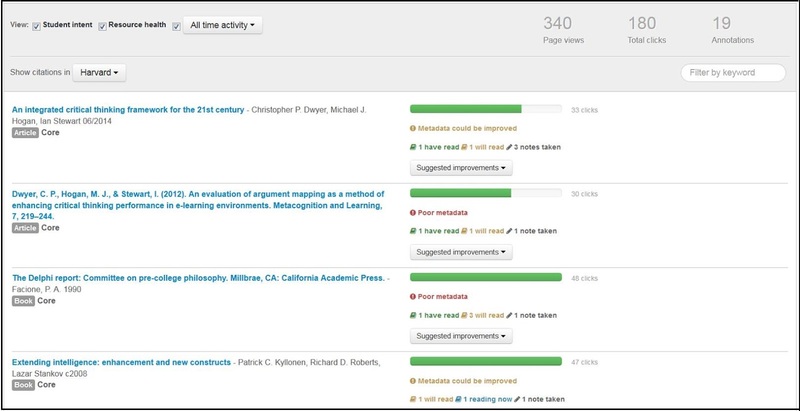 -Reading Lists can be shared if there are a number of staff teaching a module. See an example of a reading list that links to our Library catalogue, full text resources and YouTube/web resources. Click here to book an introductory training session. Please email readinglists@nuigalway.ie if you are interested in using the Reading List Service for your modules. More information about using our Reading List Service including user guides, videos and training is available from the Reading List web page. Archives & Special Collections has arranged a display to mark the centenary of the ending of the First World War. The printed volume in the display case in the foyer of the Hardiman Building comes from our set of the eight volumes of the Irish Memorial Records, originally published in 1923 by the Committee of the Irish National War Memorial. Prolonged debate had taken place in many countries both during and after the War concerning an appropriate means by which the dead should be commemorated. Initially many families had demanded the return of their loved one’s remains but the scale of the casualties had quickly precluded this from happening. In Ireland matters were further complicated by the huge shifts in public opinion and political life wrought by the events of the revolutionary period. The Committee of the Irish National War Memorial was established in 1919 with Field-Marshal Viscount French of Ypres as its first President. The Committee’s principal legacies are the Irish War Memorial Gardens at Islandbridge, Dublin and the publication of these volumes, funded by public subscription. The latter contain over 49,000 names of men who died during the First World War. The volumes were produced by the well-known contemporary Dublin publishers, Maunsel & Co. and include fine handmade paper. The page borders were created by Harry Clarke, then enjoying a significant reputation as an artist both in stained glass and other media. One hundred copies of each book were printed and they were intended to be available in most reference libraries. A list has been compiled in recent years of the whereabouts of 35 surviving sets of the Memorial Records. The set held by this library is apparently the only set in the West of Ireland. Our volumes are available for consultation by researchers in the Archives & Special Collections Room in the Hardiman Building. From the outset problems were experienced by those assembling the names as to the definition of “Irish” and criteria for inclusion in the volumes. There was, as we see in our display, also some confusion concerning duplicate entries. The volume on display exhibits the entry for Robert Gregory, of Coole Park, Gort, county Galway, who died in January 1918. The two entries appear to both refer to the same Robert Gregory. Over the years researchers have indicated that the Memorial Records are not a definitive list and that there are other Irish men who died in the War who are not listed in the volumes for various reasons, principally to do with the location at which they joined the forces or were killed. A hand-list of sources in the library for further research on the First World War is available from the Archives & Special Collections Reading Room. Update: A fix was implemented by ISS overnight, and access to our e-resources has been restored. There is a small chance that your computer will appear to be denied access still. If this is the case, refresh your browser (Ctrl+F5) or clear out your browser cache and cookies, and this will restore access back to normal. Apologies once again for any inconvenience this might have caused you. Due to IP address problems on the NUIG campus network, there are currently problems accessing all e-resources (databases, ejournals, ebooks, etc). ISS have been informed of the problem. If you can use the campus WiFi (NUIGWiFi or Eduroam) network rather than a LAN cable, you may be able to access some resources. Another option is to sign in to your Campus Account at http://www.library.nuigalway.ie/ and then use the Library Catalogue to navigate through to the e-resources you want to use. We apologise for the interruptions in access to our e-resources, and we hope ISS will have the issue rectified soon. Access to The Waterloo Directory of Irish Newspapers and Periodicals, 1800-1900 is now available. This online bibliography lists 5,800 Irish newspapers and periodicals published during the nineteenth century. It contains a diverse range of Irish historical documents, including records for nationalist magazines and broadsheets, migrant newspapers, local almanacs, provincial newspapers, society proceedings, and Church reports. It also contains over 2,000 images. The Waterloo Directory of Irish Newspapers and Periodicals, 1800-1900 includes hyperlinks to available full text e-access titles, as well as library locations, and a virtually complete list of all secondary research on each, as well as up to 32 fields of data per title, including a historical summary of each title. It has 6 searchable indexes: title, issuing body, people, town, county/country, and subject. A Global Search allows for broader searches. This resource is updated regularly. Access is available via the library catalogue. Through the IReL consortium, the Library has now access to the back issues of over 1000 Springer Journals. These journals cover a range of disciplines and go back in many instances to the very first volume of the title. A full list of the Springer titles is available for consultation (Note that the years given are the backfile years and do not include the current subscription years to the journals). Access to all these journal titles (inc. back issues) is via the Library Catalogue. Through the IReL consortium access to JSTOR Arts and Sciences XII Collection is now available. This new collection significantly expands JSTOR's coverage of the Social Sciences. A title list can be viewed here. Journal publishers in this new collection include: the American Bar Association, Brill, Lynn Reiner, Springer and many more. All the journals available in the JSTOR Arts and Sciences XII Collection can be accessed via JSTOR or via the library catalogue. Kanopy is a video streaming collection providing access to over 20,000 films from more than 850 filmmakers. Kanopy's film collection covers all subject disciplines and includes documentaries, feature films, foreign language film, independent film, instructional film and more. Over 200+ new films are added every month. The Library's access to Kanopy is via a Patron Driven Acquisition Programme. A set amount of money has been paid to the supplier of Kanopy for this financial year. If a film is viewed 4+ times this film is licensed/triggered and the budget is deducted accordingly. Note: Lecturers should ensure any films/documentaries required for course material are viewed 4+ times to ensure the film is triggered. The usage of Kanopy will be monitored regularly. Kanopy's Help Center is a very useful resource area. Viewers can add films to watchlists, create film clips and playlists highlighting particular sections or lists of films. Access to Kanopy is available from the Library Catalogue. Over the last two years the entire library’s print journal collection has been merged and are all housed in the journals area towards the rear of Floor 1. On the library catalogue they are listed as FL1J. There are no longer journals kept on Floor 2, Nursing Library or in the Law area. The space created by these moves has been put to good use making room for more study spaces for students!